WASHINGTON, D.C. -- Four percent of Americans currently mention terrorism as the most important problem facing the U.S. Although low on an absolute basis, it is the highest percentage naming this issue since May 2010. Mentions of terrorism have been near 1% for the past four years. Relatively few Americans -- usually less than 0.5% -- mentioned terrorism as the most important problem facing the U.S. prior to 9/11. But that changed quickly after the 9/11 attacks. 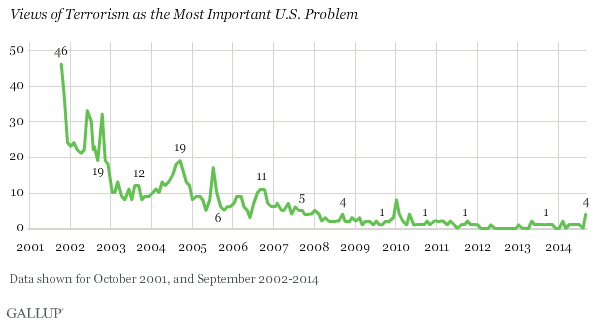 Mentions jumped to 46% the month after the attacks, the highest percentage Gallup has found for terrorism since it began asking Americans monthly to name the most important problem facing the nation in March 2001. Mentions of terrorism have spiked several times since 2001, generally in reaction to new threats or potential attacks. The most recent surge, to 8% in early 2010, came after the "Christmas Day bomber" failed to blow up a commercial U.S. flight. Each spike since 2001 has been smaller than the one before, and mentions have been lower in the months afterward. The current increase in mentions of terrorism follows a great deal of media attention about Iraq, Syria, and the terrorist group the Islamic State in Iraq and Syria (ISIS), most notably the group's beheading of two U.S. journalists. President Barack Obama will speak to the nation about these threats on Wednesday, and many analysts predict he will outline a new counterterror strategy. Gallup's open-ended "most important problem" question measures concern about terrorism as a top-of-mind issue in relation to many other issues. That a relatively low 4% mention terrorism doesn't mean Americans are not concerned about it, but rather that these concerns have not risen to the point where Americans are more likely to see it as the top problem over economic problems and other issues. In September, the issues Americans most commonly mention as the nation's top problems are dissatisfaction with government and the economy, followed closely by unemployment and immigration. Although down slightly after an initial spike in July, mentions of immigration remain elevated. Mentions of foreign policy and foreign aid increased in August, and remain higher in September. The ISIS situation is likely behind not only the increase in mentions of terrorism and foreign policy, but is also most likely related to a slight increase in mentions of Iraq, to 3% this month. Meanwhile, mentions of healthcare have been dropping over the past six months, from 15% of mentions in April to 5% in September. Thirteen years after the 9/11 terrorist attacks in New York City and Washington, D.C., terrorism is far less top-of-mind for Americans than it was immediately after those attacks. Mentions of terrorism did increase slightly this month as terrorist groups such as ISIS took actions that directly affect the U.S., prompting calls for U.S. action from many politicians and some journalists. While terrorism may be less top-of-mind to Americans -- and less likely to register as the most important problem facing the nation -- many still see it as important when asked about it specifically. In January polling, 72% of Americans said they felt terrorism was an important issue for Congress and the president to deal with this year. In February, 77% said international terrorism was a critical threat to the U.S. The economy or dissatisfaction with government may trump terrorism as the most important problem at the moment, but many Americans still see terrorism as a threat that must be dealt with, even 13 years after 9/11.